GMR Transcription, a leading U.S.-based provider of secure and affordable individual and business transcription and translation services, has officially released their new app: Easy2Transcribe. This app, now available for both iPhone and Android devices, makes the process of transcribing or translating any audio or text file easier than it’s ever been before. Easy2Transcribe puts our expert services into the palm of your hands. 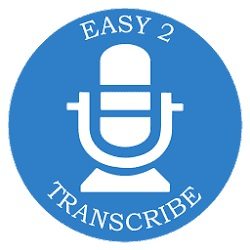 Easy2Transcribe has elminated the hassle of getting your important files transcribed in time. Easy2Transcribe places all online transcription and translation service capabilities into the hands of those who need it. Any audio file can be seamlessly recorded, organized, and sent to GMR Transcription’s team of 100 percent human and U.S.-based transcribers. Need a critical piece of audio transcribed at a quick turnaround time? Not a problem. Just open the app, upload a file, and let a professional transcriber handle the rest. Through this convenient app, GMR Transcription has eliminated the hassle of getting important files transcribed in time. With 98% transcription accuracy and a guarantee that all files are handled with expert care and security, GMR Transcription promises plenty of reasons to use Easy2Transcribe to fulfill any transcription needs. GMR Transcription also offers translation services for over 20 languages and dialects. They provide this service with the same accuracy and quick turnaround times as their transcription services, and anybody can get their files transcribed or translated directly from the Easy2Transcibe app. As a company, GMR Transcription has helped thousands of clients accomplish their transcription needs for general, academic, medical, legal, business and much more since 2004. For all of these services and more, download the Easy2Transcribe app today. ABOUT GMR TRANSCRIPTION: GMR Transcription Services, Inc. is a leading U.S.-based provider of secure and affordable transcription and translation services, relying solely on a 100 percent human workforce to accomplish mission-critical goals and objectives for individuals, private organizations, public corporations, government agencies, and academic institutions. With over 3 million minutes of transcription completed, GMR Transcription is renowned for its nationwide network of 250+ highly educated and skilled linguistics professionals. GMR Transcription is an individual and business transcription company well-equipped to provide all online transcription needs.